I tried to write this last night, but simply could not muster up enough positive energy. I have wanted to go to North Korea ever since I touched down in Seoul three years ago. So to be so close to experiencing the infamous North and to have it all come crashing down was pretty disappointing. Now that’s the last of the negative. Yesterday, when we got off the phone with Simon and told him we were not going to be able to make it, I immediately suggested to Dane that we go get a beer. After he told me it was too early (it was after 10 AM at least!) we sat down and discussed our options. Alan is going to be in Nepal on Sept. 2nd, so we figured we might as well take our newly acquired free time and go somewhere. We wanted to go somewhere that would make us feel better and take our minds off this missed opportunity. Naturally, my first suggestion was Las Vegas! We are hoping to get a lot of money back from the North Korea trip thanks to travel insurance, so why not double down right away?! Well obviously Vegas is too far, so we settled on somewhere that is cheap, on the way, and a place where we can have a lot of fun! We are going back to Bangkok! Dane and I found a cheap, direct flight to Bangkok so we will be headed there tomorrow afternoon. Its not the mysterious start to the trip that we thought we would have had in North Korea, but we know it will still be fun and a good way to salvage the time we have before we meet Alan in Kathmandu. We dont even really have a plan, we are just going to go there, hang out for a few days and try to meet some new people. If all goes well, we will have some stories to compete with whatever kind of crazy stuff Alan is doing in Pyongyang!! So, it’s not all bad news. Even though North Korea won’t work out for us, Thailand is always a good time. We also already received confirmation that we will get our flight to Beijing refunded by the airline, and we are going to apply for a refund for the NK trip and have been told it will almost certainly be refunded. Things are starting to look up for us and hopefully there will be no more bad news to report from here on out! At 4 PM the day before our flight, Seoul Public Schools canceled the next day’s classes in anticipation of Typhoon Bolaven. We knew our 8:10 AM flight to Beijing would be in jeopardy of being delayed or cancelled. When we were commuting to the airport as the sunlight was creeping over the horizon, however, we felt quite confident that we were in the clear. We were certain our flight to Beijing would depart on time. Nine hours later we left the airport. The North Korea leg of the trip was over for us before it even began. After the bridges from Incheon to Seoul were reopened, we took the train back into Seoul defeated. The most frustrating thing about the cancellation of our flight was that it never felt as if the typhoon ever reached Incheon. Every airline that had flights leaving before 9:00 AM got their planes off the ground and to their destinations except one, China Southern, our airline. At 8:10 AM we looked out the airport windows, watching planes zoom down the runway and into the sky. The sun even made brief appearances through the cloud cover. That only made it worse. A flight leaving from Incheon airport just after 8:10 AM. We got Alan on the phone and tried to see if we could catch up with the tour the following day. He went to the tour headquarters in Beijing and tried to get some answers for us. The next phone call we got was from Simon, one of the tour organizers, saying that we could catch up with the tour in two days time if we caught a flight to Beijing tomorrow and circumvented Chinese law (you can only stay in an airport in China for 24 hours without a visa; we would have had to be there for 26). Also, we would need to acquire an emergency Chinese visa in Pyongyang for our flight to Nepal for reasons more complicated than they need to be. We needed some time to think through our options, but we didn’t have any. Simon told us we had to make the decision immediately. The flight from Beijing to Pyongyang had been pushed ahead one hour. It now left at 12:05 PM. We backed out, abandoning Alan and our chances to see North Korea. Shortly after, our friend, Judy, called Eric. The bridges connecting Seoul to Incheon were being closed. We were stuck in the airport with no flight and no ability to get back to Seoul for at least a few hours. We looked out the windows. Rays of sunshine taunted us as they flashed through the clouds. Alan would get to see behind the curtains of North Korea. We would not. It’s often said you have to take the bad with the good. We’re still looking for the good. 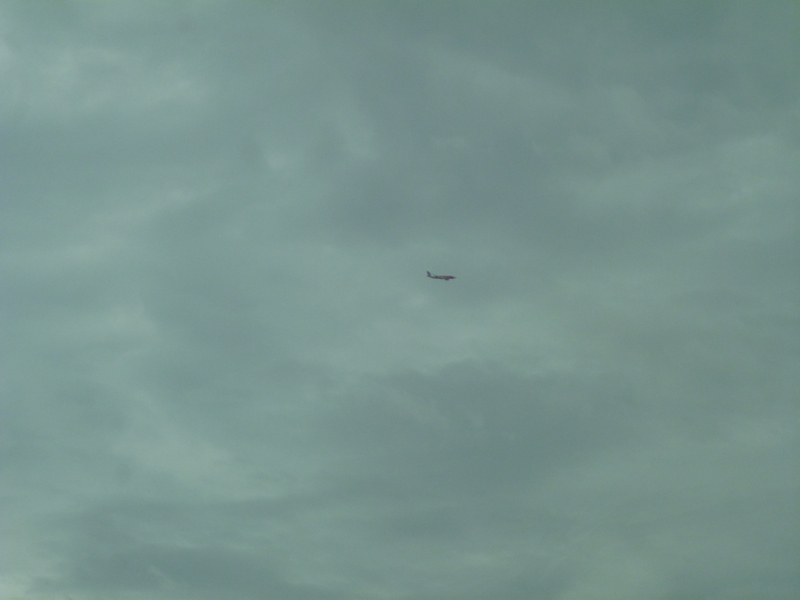 The sky over Incheon when our cancelled China Southern flight was supposed to take off. Every other airline allowed flights to depart at 8:10 AM except for China Southern. I’m sitting in a cafe waiting for the ice in my cup to melt, so that I have a little more to drink. I’d order another ice coffee, but I’m saving money for a nearly four-month trip, and I really don’t need the caffeine since I’ll be trying to go to bed early tonight in order to wake up at 5 a.m. tomorrow to catch a flight to Beijing. This is the usual boring part of long trips on a budget, but I don’t anticipate having to get used to it for this trip. I soon will be fascinated by North Korea, have my breath taken away while hiking Mount Everest, have my senses dazzled by India, be swept up by the history of Petra and the Pyramids, and soak in every bit of Southern Africa. I’ll get to see the last country in the world existing in a truly totalitarian state. I’ll get to see the highest point on Earth. I’ll get to see several world wonders, and I’ll get to go on my first ever safari. Boring will hardly enter into the equation. Alan left South Korea today. He is going to the Beijing headquarters of the company taking us on a tour of North Korea. Alan is Irish, so the cost of his visa to enter China is far less than it is for me and Eric. Fortunately for us, he was nice enough to take our paperwork with him and file it for us, allowing us to avoid the cost of a Chinese Visa. Unfortunately for us, a typhoon is closing in on Seoul, and it is projected to arrive in full force at about the time our plane is scheduled to depart tomorrow morning. Of course, the weather won’t really matter if Eric and I aren’t allowed to depart Seoul for Beijing. You are allowed to travel to Chinese airports without a visa if you are catching a connecting flight out of the country within 24 hours (or something like that). We don’t have a visa. We do have a connecting flight. Unfortunately, our e-ticket looks like something a fourth grader made as part of their presentation on airports. It contains no bar code or reservation number. It just lists our names and a flight number for Air Koryo. It looks very unofficial, and I imagine won’t inspire confidence amongst customs officials. Last night, I received a phone call from Eric. He started, “I know you’re looking for good news, but have you looked at the money Alan got for us?” A few weeks ago we decided to go ahead and buy a chunk of Indian Rupees. Their currency was near an all-time low, so we figured we’d be able to save some money by purchasing as many Rupees as we could then since it would likely rise in value during the six weeks before we arrived. I put down my phone and opened the envelope containing the Rupees. There was money in it. Good sign. I looked at the bills. They were Indonesian Rupiah. Bad sign. Eric went to the bank to try to exchange the Rupiah into Rupees as soon as he could. The bank wanted him to exchange his Rupiah into Korean Won and then into Rupees. He would lose roughly $150 in the process, and oh yeah, the bank didn’t have enough Rupees on hand to make a full exchange, so he cancelled the transaction. With everything there is usually bad and good. We’ve had plenty of bad so far, so that means there is plenty of good waiting for us around the corner. Things have a way of evening out. The start of our trip already is proving to be anything but boring. Besides, if weather delays our flight out of Seoul, if Chinese custom officials refuse to accept our North Korean e-ticket and Eric and I miss the tour of North Korea and have to meet Alan in Nepal a week later, we can just go to Indonesia for the week. We have plenty of Rupiah.